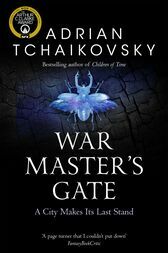 The penultimate book in the epic Shadows of the Apt cycle by Adrian Tchaikovsky, War Master's Gate is an explosive fantasy that propels you towards a dramatic conclusion. A city makes its last stand . . . Relentlessly advancing towards Collegium, the Empire is again seeking to break down the city's walls. The mighty imperial armies have learnt from their failures, and Empress Seda will brook no weakness in her soldiers. After all, Stenwold Maker has earned his title, and the War Master has strategies to save his city. His aviators rule the skies - but the Wasp Kinden Empire has developed a terrifying new aerial weapon. Yet the campaign may be decided far from marching armies and the noise of battle. In an ancient forest, where Mantis clans pursue their own civil war, the Empress Seda is seeking a lost power of the old world. Cheerwell Maker must stop her, at any cost, but will their rivalry awaken something far deadlier? Something that could make even their clash of nations pale into insignificance . . . He is the author of the critically acclaimed Shadows of the Apt series, Echoes of the Fall series, and several stand-alones, including Children of Time, the winner of the 30th Anniversary Arthur C. Clarke Award for Best Science Fiction Novel.